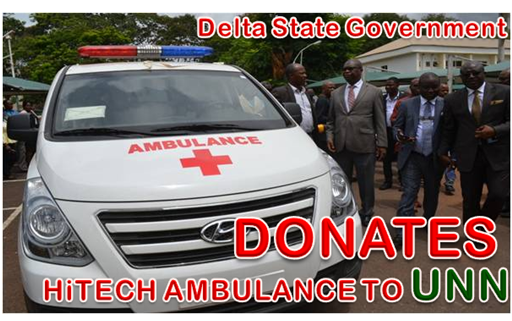 The Delta State Governor, Senator Ifeanyi Okowa has donated a fully equipped HI-Tech Ambulance to the University of Nigeria, Nsukka . Presenting the ambulance to the Vice-Chancellor at Nsukka campus of the university, on Tuesday, June 19, 2018, the Commissioner of Information, Delta State, Mr Patrick Ukah said the donation was a fulfilment of the governor’s promise to reach out to the university after he was conferred the “Dignity of Man Award” at the university’s 57th Convocation ceremony. 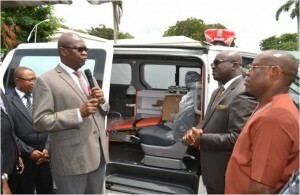 “Governor Okowa is known for keeping to his promise, has sent us to deliver this ambulance to the University of Nigeria”, Ukah said while handing over documents of the ambulance to the Vice-Chancellor. 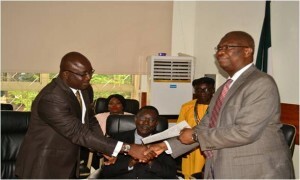 In his response, the Vice-Chancellor, Professor Benjamin Ozumba thanked the Governor for the gesture, describing the donation as a timely intervention that would boost medical service delivery in the university. 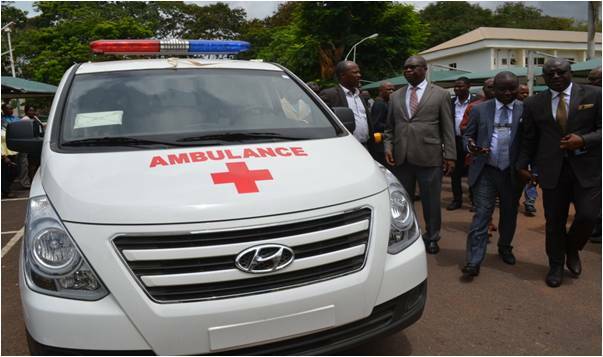 “Senator Okowa does not talk too much; but he goes about doing too much”, Prof Ozumba said, while describing the ambulance as the best of its kind. Prof. Ozumba stated that the ambulance would complement his effort at establishing a diagnostic centre in Nsukka campus. On the entourage of the commissioner were the Chief Job Creation Officer, Prof Eric Eboh; the Permanent Secretary, Directorate of Government house and Protocol, Sir Edwin Ogidi-Ebegbaje; the Corporate Affairs Officer, Mrs Marian Ashikodi; the Chief Admin Officer, Mr Lucky Nkemachor, among other supporting staff. Principal Officers of the University of Nigeria and other management personnel witnessed the donation of the ambulance, which started with a courtesy visit by the Delta State team on the Vice-Chancellor in his conference room. 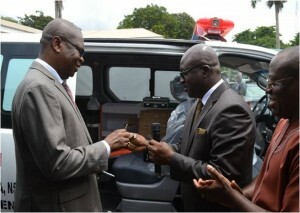 The Commissioner of Information, Delta State, Mr Patrick Ukah (right) presenting the ambulance key to the Vice-Chancellor, Prof Benjamin Ozumba. 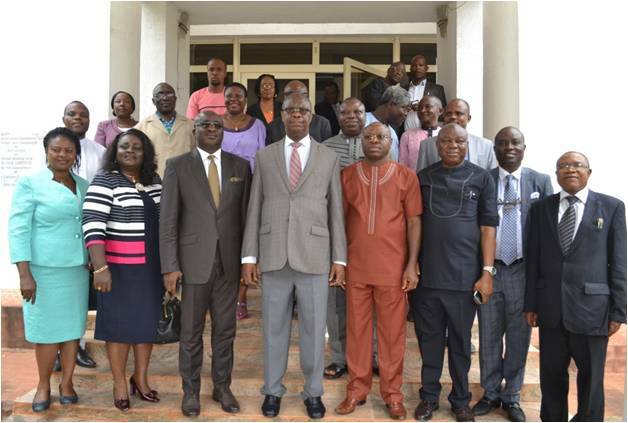 With them is the Chief Job Creation Officer, Delta State, Prof Eric Eboh.